What’s the Best Firewood to Burn? Your fireplace has been inspected, cleaned, and now you’re ready to light your first fire. But what type of wood should you burn? There are a lot of choices. You just need to follow a few guidelines to get the best blaze for your buck. The type of wood is only part of the equation. It should also be cut properly, seasoned well, and stored in a dry area. The proper wood will also burn cleaner and promote less buildup of creosote in the flue. Follow the guidelines below to get the most enjoyment out of your fireplace. Both are fine to burn, but each type offers a different experience. Hardwoods gives off the most heat and burn the longest. It’s sturdy and will burn a lot longer than softwoods. Some common hardwoods oak, maple and cherry. A very hot, long burning fire may not be what you want for every season though. In early fall and late spring, you may not want a fire that burns as hot. Or, if your fireplace is not your main source of warmth, it may be better to burn a softer wood such as poplar, pine, spruce, or balsam. These woods will burn at a faster rate as well. More importantly, the wood must be properly seasoned. Don’t get the salt and pepper shakers out, that’s not the kind of seasoning we’re talking about. According to the CSIA, seasoned wood is cut wood that has been stored for a minimum of 6 months in a cool, dry place. It’s better to get seasoned wood that has at least experienced one summer’s worth of temperatures, though. The wood needs to have time to no longer be green (new) and to achieve the proper moisture level. Checks or cracks in the end grain can be an indication of dryness, but may not be a reliable indicator. Some wet wood has checks and some dry wood has no checks. The wood tends to darken from white or cream colour to grey or yellow as it dries. Two dry pieces banged together sound hollow; wet pieces sound solid and dull. Dry wood weighs much less than wet wood. Split a piece of wood. If the exposed surface feels damp, the wood is too wet to burn. If in doubt, burn some. Dry wood ignites and burns easily; wet wood is hard to light and hisses in the fire. Obvious, but often overlooked, the size and shape of the wood will dictate your experience when burning a fire. First, the wood needs to be smaller than your fireplace. Otherwise you’ll spend more time outside with a saw than cozying up next to the fire. The diameter should vary in size between 3 and 6 inches. Start with smaller pieces, and occasionally use larger pieces of wood to keep the fire burning longer. The best firewood to burn is well seasoned wood. 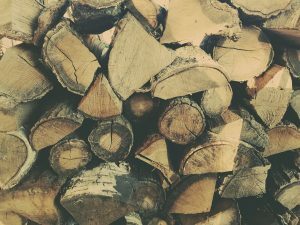 Hardwood is better for colder nights, and softwood for shorter burns. Check to see that it’s not too wet, that it’s smaller than your fireplace, and the diameter ranges from 3-6 inches.